Lady Sylvia Hermon has suggested that dissident republicans in Northern Ireland could use money from stolen ATM machines to fund attacks on police in the event of a no-deal Brexit. Earlier this month police warned that dissident republicans may be profiting from involvement in the thefts. During Northern Ireland questions Lady Hermon said that there are fears stolen cash machines could be being taken by dissidents planning to use the money to fund attacks against police in the event of a no-deal Brexit. "Has the minister been made aware by the police service of Northern Ireland that dissident republicans are responsible for the recent spate of thefts of ATMs across Northern Ireland and are intent upon using that stolen money to purchase weaponry to attack police officers and others along the border in the event of a no-deal Brexit?," The North Down MP asked. Northern Ireland minister John Penrose said he could not comment due to ongoing police investigations, but acknowledged that there had been a "great deal of speculation about this matter". "I think all I can say, and I hope she understands, in my response here is that policing obviously is an operational matter and there are ongoing and live police investigations into this as we speak, therefore I can't really go much further into it," he said. 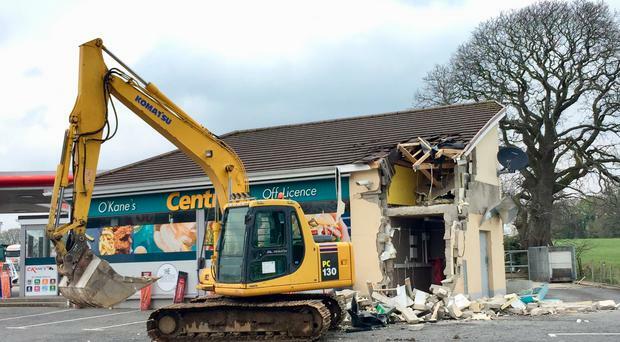 The theft of an ATM in Dungiven in the early hours of Sunday morning was the ninth ATM theft in Northern Ireland this year. On Monday police said that the discovery of a mortar tube and command wire in Castwellan, Co Down prevented an attack on police by dissident republicans. A recent report compiled by two senior Unesco officials said violence could occur in Northern Ireland "in as little as six weeks" following a no-deal Brexit. He said there is no way to avoid the return of security patrols if there is a no-deal Brexit. “The moment you see anything that starts to create the perception of a very hard distinction between north and south, it creates a catalyst that allows people to exploit that position and certainly dissident republicans would be in that category,” he said.